VR is hard. No wait, scrap that. Creating any sort of content full-stop is hard. Even sitting here writing this article is a challenge, just writing an introduction that draws someone in without slipping into hyperbole is often half the battle when it comes to writing a piece. But at least most content creators have a rulebook to follow. Between us, the editors at TechRadar have penned literally thousands of articles on the site, and with each article we learn a little more about what works and what doesn't, which rules to follow and which to ignore. But when it comes to VR there is no rulebook. There is no one with a huge wealth of experience of what works and what doesn't work, no shining examples of VR done right or VR done wrong. Everyone's in the dark, and there is literally no light... yet. Which is exactly what the BBC's R&D department is trying to change. The organisation doesn't have to worry about immediately having to make something profitable, or about reaching the widest possible audience in the shortest possible time. Instead, the researchers and developers at the BBC are free to imagine what the world of broadcasting will look like over the next 5-10 years. They have the freedom to do the messy experimentation to learn what works and what doesn't, which technologies have a future and which are mere gimmicks, and once they've worked to find a solution they are free to share this information not just internally at the BBC, but with the rest of the industry. They do this all without charging a penny. They're operating entirely using public money after all. Playing around with virtual reality might sound luxurious, but it's important to put the BBC's work into perspective. This is an organisation that helped to define the original radio and broadcast standards, that brought Ceefax to the world when the world wide web was still in its infancy, and that set the bar for how broadcaster streaming should work with iPlayer. Now it's using those same problem-solving abilities to tackle the challenges VR brings. The BBC might be as in the dark as everyone else, but without the need to find a solution that immediately makes money it can focus on getting it right without having to worry about getting it profitable. I went along to the BBC's R&D department recently to try out some of these experiments, which ranged from 360 videos of traditional news events, to historical documentaries and interactive experiences that wouldn't have been out of place in the science museum. Space is terrifying, so when I was lead into a dark room and told I was about to go on a space walk, I knew my vertigo was going to give me a tough time. Better still, Home involves strapping a Bluetooth heart rate monitor to your wrist. Ostensibly this is so that the software can then pump the sound of your heartbeat into your headphones, increasing the sense of claustrophobia you feel as you use the two Vive controllers to pull yourself along the outside of the International Space Station. But what it ended up meaning for me is that the BBC researcher could see just how terrified I was when I saw the hatch open for the first time to reveal the earth over 200 miles beneath me. He even apologised after he'd seen how high my heart rate was because he thought the heart rate monitor had been playing up. Unfortunately technical issues meant that I was unable to complete the demo, but what I got to experience was probably the closest I'm ever going to get to going on an actual space walk. "Oh wow, look at those storm clouds gathering over the British Isles" my in-game instructor told me over my headphones. I was supposed to gaze lovingly at the island I call home from space, but instead all I could do was refocus my attention on the task at hand as my brain screamed at me, "YOU'RE IN SPACE YOU'RE IN SPACE OH BLOODY CHRIST YOU'RE IN SPACE." As a piece of non-fiction documentary Home didn't teach me anything new about how the ISS operates, or the science that goes on behind it. But what it did do is make me feel the claustrophobia and vertigo that astronauts on the space station feel every day as they work to keep one of the world's most advanced scientific laboratories functioning. In an abrupt change of tone, my next VR demo switched the modern setting of space with the more historical Dublin during the 1916 Easter Rising, where a group of Irish rebels rose up against their British rulers. With the real life recording of Willie McNieve playing in my ears, I was transported through the events of the six day uprising. I saw the rebels take control of, and then barricade themselves inside Dublin's post office. I saw them preparing to ambush a British brigade as it drove by, waiting for an order to open fire that never came. I even saw them trade fire with British troops on the streets of Dublin, which involved a really cool moment of using the Oculus Rift's positional head tracking to peer round a corner at the approaching British troops. Interestingly, Easter Rising: Voice of a Rebel opts to eschew photo realism in favour of a more stylised art style. The figures around me that made up the other members of the uprising often felt like the kinds of mannequins you'd find in a historic reconstruction at a museum, but as scenes changed the polygons that made them up exploded apart and reformed. Voice of a Rebel uses devices like this to carry you through the experience at a decent pace without disorientating you, moving the world around you without taking control of your head movement (a big no no in VR). Perhaps the most encouraging thing about this demo is that it feels like there's no shortage of historical events that would benefit from a VR retelling. Easter Rising works well because it's based on the personal recollections of a single man involved in the events, and there are countless examples of other figures throughout history that have recorded similarly personal accounts. 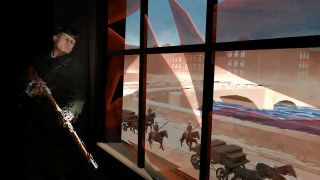 Easter Rising was a remarkably polished documentary, especially considering it's a first attempt in an area that VR hasn't yet experimented with, and we're excited to see which other historical events the BBC chooses to tackle next. From historical accounts to modern documentaries, the next demo on display was a fictional account of a group of migrants attempting to cross the Mediterranean called We Wait. Turning an event that's currently happening into an interactive experience is one that's fraught with difficulties. Too artistic and you risk romanticising their struggle, too photorealistic and you risk revelling in their suffering. We Wait's response to these issues is to present a stylised account of the events. The figures that accompany you on the tiny boat looks more like puppets than real people, but their narration makes up for this by bringing home the human realities of the people's struggle. Much like the Home demo, We Wait probably won't teach you anything about the migrant crisis that you didn't know already, but instead it aims to humanise a news story that all too often feels like a tale of numbers rather than people. I wasn't sold on the art style of the characters, but We Wait shows VR's potential to shed new light on a news story that people might feel all too familiar with. The final virtual reality project we got to experience was an interactive children's story called The Turning Forest. According to a senior member of the BBC's R&D team, The Turning Forest was an attempt to experiment with the possibilities of sound in virtual reality. It wasn't as advanced as Nvidia's VRWorks Audio that I recently got the chance to try out, but it was nevertheless an interesting attempt to integrate audio more fully into the VR experience. The demo also featured the use of a vibrating backpack to enhance the sound within the demo without needing to turn the headphone volume up too loud. The demo tell the story of two children playing in a colorful storybook forest, but instead of showing the children directly the demo instead lets the user follow them around using sound alone, and uses the movement of leaves on the forest floor to show their exact locations. The combination of the sound and visual cues made it remarkably easy to place them within the space, but the demo frustratingly often placed a lot of the action behind me, forcing me to crane my neck to watch what was going on. When a fairy tale monster appeared on the scene, the vibration coming from the backpack finally became noticeable. At one point the beast jumped from outside of my field of view and landed on all fours in front of me, and the vibration from my backpack gave a sense of weight to the creature that would have required a lot more volume otherwise. When it then bared its teeth at me I was able to activate a series of chimes by looking at each of the teeth in turn. The Turning Forest was the least impressive of the VR demos I got a chance to try. It felt more like a proof of concept than a full demo, a taste of what's possible rather than a complete experience. The demos I got a chance to try out weren't all amazing experiences by any stretch, but they showed off the enormous potential VR has outside of the pure gaming sense. The historical documentary style of Easter Uprising in particular felt like a format that's likely to really take off as more VR headsets make their way into consumers' hands. But beyond formats, the demos worked to try and establish a language of VR storytelling, combining visuals, audio and interactivity to paint a picture of an event that's unlike anything possible on TV, radio or even online. Playing the demos made me appreciate how safely most VR demos play their cards when it comes to story. They rely on the language of film and games to tell their stories, rather than fully using the new possibilities afforded by VR. Not everything the BBC has shown off will become a format in its own right, but it's clear that the BBC wants to leave no stone unturned when it comes to exploring this new and exciting medium. If you're interested in trying out these demos for yourself, they should all be available on the BBC's Taster site 'soon' according to the BBC.